As was noted elsewhere (The Belt Pulley, January/February 1994, Vol. 7, No. 1), the Howard B. Hanks family moved to the current Fred J. Hanks farm in LeRoy, Minnesota, in 1945. In those days, the 400-acre farm was known as the “Bagan farm.” As mentioned in the above-cited article, one of the restored tractors which are still used on the farm is a 1950 Massey-Harris 22. (Serial No. GR6729). Of all the tractors on the farm, the 22 has been there the longest time. The 22 was purchased as a used tractor by the Hanks family from an International Harvester dealership in Austin, Minnesota, in 1954, and was put to immediate use. At that time, the farming operation included three other tractors: a 1935 John Deere D (pictured on the back cover of the January 1993 issue of Green magazine, Vol. 9, No. 1); a 1951 Massey-Harris 44 (The Belt Pulley, July/August 1993, Vol. 6, No. 4, p. 26); and a 1948 Ford 8N. The farm was operated by Howard Hanks and his two sons; Fred, who had returned to the farm in June of 1947 from military service in Germany as a Second Lieutenant in the United States Army, and John, who had just graduated from LeRoy High School in 1953. The daily tasks for the 22 included (and still includes) hauling of grain and manure. During hay seasons, the 22 was and continues to be very busy hauling hay from the field. Because the author’s father, Wayne A. Wells, cooperated with the Hanks family (his father-in-law and brothers-in-law) during hay season, the author, as a youth, had occasion to use the 22 to haul many of these loads of hay from the field himself. Field work was generally limited to cultivating corn and soybeans with the two-row cultivator which came as part of the purchase package with the 22. However, in the fall of 1956, some unusually hard plowing conditions existed and the 22 was hitched to the 1951 Massey-Harris 44 to give assistance with the plowing. The stiff hitch connecting the two tractors was made of two 2 x 4 oak boards bolted together. The 1950 Massey-Harris 22 provides some additional help to the 1951 Massey Harris 44 in plowing in the fall of 1956 on the Hanks farm in Beaver Township, Fillmore County in Mower County, Minnesota. A special task for the 22 evolved in the mid-1950s. About this time, farmers began to make use of herbicides on their crops. Anticipating this trend, the Hanks family’s 22 was fitted with a mounted sprayer purchased from Sears, Roebuck and Company. This sprayer looked identical to a mounted sprayer pictured in the 1949 advertisement by Massey-Harris included with this article, except that the Sears sprayer was not fitted with the optional drop nozzle attachments offered by Massey-Harris. In the advertisement, the Massey-Harris sprayer is shown mounted on a 22. Although no pictures have yet been found of the Hanks family’s 22 showing the front-mounted spray booms, the picture from the Massey-Harris advertisement looks identical to the Hanks’ 22 during those summers when it was employed for spraying herbicides. As shown in the advertisement, the booms are located on the front of the tractor ahead of the driver. The tank was mounted on the rear of the tractor. The spray was pressurized by a pump connected to the power take-off. The booms could be folded into an upright position for transport. Because the Hanks family had always performed custom combining and baling in the neighborhood, it was almost inevitable that the sprayer, too, was employed for custom work. This custom spraying became the domain of my Uncle Fred Hanks. Each June and July in the late 1950s, we would see Uncle Fred on the 22 riding down some dirt road headed to another job. Tractor tire marks evenly spaced across some immature oat field was sure evidence that Uncle Fred had recently been there! Sitting in the back or our 1957 Plymouth, riding down the neighborhood roads, we children would scan our neighbors’ oat fields for any small scattering of yellow which would indicate an infestation of wild mustard flowers. This would draw a comment from us. “They better had give Uncle Fred a call.” (A generation later we might have used the phrase “Who you gonna call?” from the movie Ghostbusters!). Mustard is grown as a crop, however, in an oat field its persistent volunteer growth becomes a yield stealing menace. The 22 was ideally fitted for this type of work. The large rear wheels and high revving engine allowed the 22 to really scoot down the road. A high transport speed was important for custom work so as not to waste time. The large rear wheels were a selling point for the 22 in 1950. (See A World of Power, a 1950 Massey-Harris promotional movie available from Keith Oltrogge, Box 529, Denver, IA 50622-0529, Telephone: (319) 984-5292.) The large rear wheels allowed the 22 to reach a top speed of 13.02 mph. (C.H. Wendel, Nebraska Tractor Tests  p. 145.) However, this was at the 1500 engine rpm level. The 22 had Twin-Power which had been available on earlier Massey-Harris models. Twin-Power was a feature which reserved a special high range on the throttle control (from 1500-1800 rpms) to be used for belt work. (Michael Williams, Massey-Ferguson Tractors (1987), pp. 46-47.) The cast-iron quadrant for the throttle control lever behind the steering wheel on the 22 had a little block built into the quadrant which was intended to prevent the lever from being pulled down into the special 1500-1800 rpm range. However, the throttle control lever could be lifted up and over this little block easily. (C.H. Wendel, Massey Tractors, (1992) p. 67.) The operator’s manual for the 22 warned against use of the 1500-1800 rpm range for drawbar work. (Operating Instructions and Service Manual for the Massey-Harris 22 and 22-K, p. 5.) Pulling a full load of hay at a speed of 16 mph down a narrow township road with steep ditches on either side could get a bit scary. As youngsters, hauling loads of hay on the road from the fields to the barn, we were told not to experiment with the throttle in the range from 1500-1800 rpm on the 22. We estimated, at the time, that the speed developed at 1800 rpm must have reached up to 20 mph. This was twice the speed of the small rear-wheeled Farmall B, owned by the Wells family (See Farmall B and Equipment, a 1939 International Harvester movie), which often worked together with the 22 during hay seasons and, therefore, was the natural counterpoint for comparisons with the 22. This 1941 Farmall B is featured in the story “The Family’s Second Tractor,” The Belt Pulley, November/December 1993, Vol. 6, Issue 6, p. 30. The B operated at the slower top engine speed of 1400 rpm which was common to most Farmalls. Wayne A. Wells drives the Massey-Harris 22 pulling three full loads of hay on the Hanks farm during haying season of 1956. 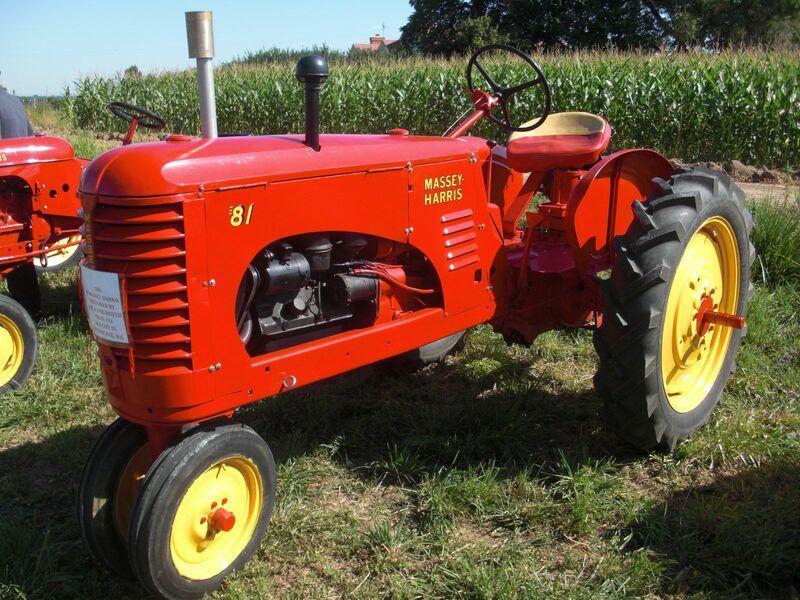 Larger Massey-Harris models offered contemporaneously with the model 81, like the Massey-Harris models 101, 201, and 101 Junior, were powered either with the 4-cylinder Continental MFA engine or the 6-cylinder T-57 503 Chrysler engine. These models, too, could develop 1800 rpm; however, their top speed was 17.4 mph. (Nebraska Tractor Tests, pp. 113, 117 and 131.) This was fast, even for the 1950s! For the period of time from 1939 to 1946 when the 101 and 201 were manufactured, this speed must have been far in advance of the quality of the rural roads and the technology of brakes. It may have been that the Massey-Harris company realized this and therefore made a conscious effort to gear the later models down so that even at 1800 rpm the tractor would not move so fast in road gear. During this time, other tractor makers were busy increasing the range of speeds for their tractors. With Massey-Harris decreasing their road speeds and other manufacturers increasing their road speeds, a happy common ground appears to have been reached in the 1950s which did not change substantially until the mid-1960s. The Continental Motor Company of Muskegon, Michigan supplied a great number of engines to the Massey-Harris Company for installation in various Massey-Harris tractors. Massey-Harris used to advertise the 101 and the 201 as “fast tractors.” Indeed, there is a scene from a 1941 Massey-Harris promotional movie which shows a Massey-Harris 101 Standard hauling a load of wheat to the grain elevator. The tractor and wagon passes up a car which is pulling off onto the shoulder of the road. (Mechanized Agriculture Meets the Challenge, (1941) available from Keith Oltrogge, noted above.) During this scene, the narrator notes that “the motorcar driver courteously yields to the fast-moving tractor.” We often thought that the “motorcar driver” may not have been so much courteous as scared after seeing a ton-and-a-half load of grain and a 5700 lb. tractor bearing down on him at 17-18 mph. He may have been justified in this fear, given the length of time required to stop that load! The 22 continues to play an active role on the Hanks family farm, even after forty years of service. In 1989 it was restored and repainted. Since that time, the 22 has been exhibited and paraded at local tractor shows in the summer. One such show is the Root River Antique Power Association Show held in mid-July of each year at Racine, Minnesota. At the time of the repainting of the 22, the hubs of the wheels were mistakenly painted orange. Current plans include returning these hubs to their original yellow color. The 22 continues to be a fun tractor to drive and carries with it a lot of memories. We hope its restoration will guarantee that this fun will be carried on to future generations.